Index SOLD Loops no longer made with Fine Silver - replaced with Sterling Silver (925/1000). Earring styles go in and out of fashion depending in large part on whether current hairstyles cover or expose the ear. Earrings on long loops are a very early style, usually made from gold. Finds from the Mycenaean and Minoan cultures of the 14th and 13th centuries BCE include an integral 'boat' decoration, whilst finds from Phoenicia dating from the 7th-6th century BCE have a decoration applied to the base of the loop. Plain loops - "hoop earrings" - remain popular in most cultures. 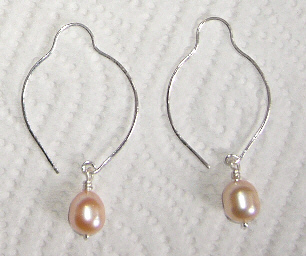 The design is inspired by my annoyance over losing one earring of a pair for the one-too-manyth time! The length and shape of the earwires ensure that they cannot rotate out of the ear, and they are remarkably comfortable to wear. The 35mm short loops are hand-forged from Fine Silver (999/1000) and the pearls are freshwater cultured pearls of baroque (irregular) form. N.B. Although they look rather lemon-shaped when off, once in the ear the earwires appear to be 'hoops'.